Because my sweet and darling sister is going to Tulum next month and I wasn’t invited (I know, right?! ), I’m desert tripping off to Palm Springs. Here is everything I will be eating, drinking, doing, wearing, and otherwise enjoying in this sunny desert oasis. A version of this article was originally published on The Fullest. Tucked just a stone’s throw away from Los Angeles, A-listers have been flocking the small swanky town of Palm Springs since the 1920s. With sunshine virtually 365 days a year, zero traffic, and an iconic mixed modern flair you won’t find anywhere else, Palm Springs is the perfect 48-hour desert oasis escape. From its lavish luxe spas and picturesque mountain views to its retro-chic award-winning boutique hotels, Palm Springs is a west coast travel MUST. So grab your favorite straw hat, two swimsuits, best girlfriends, and kindly turn on your out-of-office email autoresponder, you’ve got a desert springs sunset to catch! Did we mention it’s just a two-hour drive from LA? Here is everything you don’t want to miss including where to stay, what to eat, when to visit (it involves the moon), which hotel pools you can hang at (for free! ), and all the Instagram hotspots. My boyfriend and I have made Korakia Pensione our home away from home on more than one occasion. With not one but TWO heated saltwater pools (do not open your eyes underwater), in-room record players and authentic bohemian flavor, stay here for a relaxing weekend getaway. You’ll feel like you’ve been picked up and transported into a desert Moroccan paradise. Expect fresh citrus water to quench your thirst, flower-filled walkways, and delicate fairy lights. It’s the kind of place where a one night stay feels like seven. Insider tip! Book a room on the Mediterranean side. I’m partial to the Mykonos Suite. If you have the budget, splurge. The Parker Palm Springs is straight out of the story Alice In Wonderland. With Instagram-worthy exteriors, excellently designed interiors, and luxuries little details like the Hermès bar of soap sitting next to the sink, The Parker is perfectly on point. Within its high walls and hedges you’ll find two outdoor pools — the Silicone Valley pool for families and the Gene Autry pool for adults (open 24 hours!) — expertly manicured lawns, a giant chess board, croquet, hammocks, and a poolside Lemonade Stand. Even if you don’t stay here, stop by. It’s worth the walk around. If you’re going for the perfect Insta-pic, this spot delivers. The Saguaro is a rollercoaster vibrant rainbow paradise. By far one of the most recognizable hotels in Palm Springs, its brightly colored backdrop and equally exciting in-house eateries add an extra layer of fun to the mix. Known for its legendary pool parties, fresh fruit margaritas, and the best nachos in PSP, if this was my senior year and I was giving awards The Saguaro would take home most likely to give you a sunburn. Don’t forget you’re frying! What was once a quickly fading beaten down Westward Ho/Denny’s combo-plex, is now one of the hottest spots in the Palm Springs desert. The Ace Hotel & Swim Club is home to two big pools, a vintage photo booth, award-winning room service, free wifi, and monthly full moon ceremonies. (Who knew??) There is almost always someone celebrating something at Ace. Expect live music, poolside DJs, bingo nights, karaoke, and lots of partying (it's open late). Plus, everyone’s invited. Even if you’re not staying at the resort, it’s $30 for a day pass which includes access to the steam room, sauna, and gym. Score! The new kid on the block and already hometown favorite. Plus you can use the pool, for free! Quickly making a name for itself as the latest desert hipster hangout, Arrive is home to two incredible restaurants (Reservoir and Draughtsman), a small coffee shop (Customs Coffee), and the best Ice Cream & Shop(pe) in Palm Springs. With poolside Kundalini yoga classes, ping pong tables, movie nights, super speedy wifi, and a full calendar of ongoing events, you’re guaranteed to never get bored. Next time I go to Palm Springs I’m bringing friends (you’re invited, of course!) and staying in this beautifully designed 7-bedroom boho chic AirBnB. Ideal for large groups, retreats, and events of all kinds, this bungalow style boutique option is quintessential PSP. With its chandeliered cabanas, sparkly blue pool, and black and white stripe lounges, I would likely never leave here. Seriously. Take full advantage of this year-round sunny sanctuary by lounging poolside at any of the aforementioned locations. Only get up to reapply your sunscreen. You’re on vacation! Aside from hotel hopping and lounging poolside which I highly recommend doing for at least six consecutive hours but not more than seven, you don’t want a sunburn! 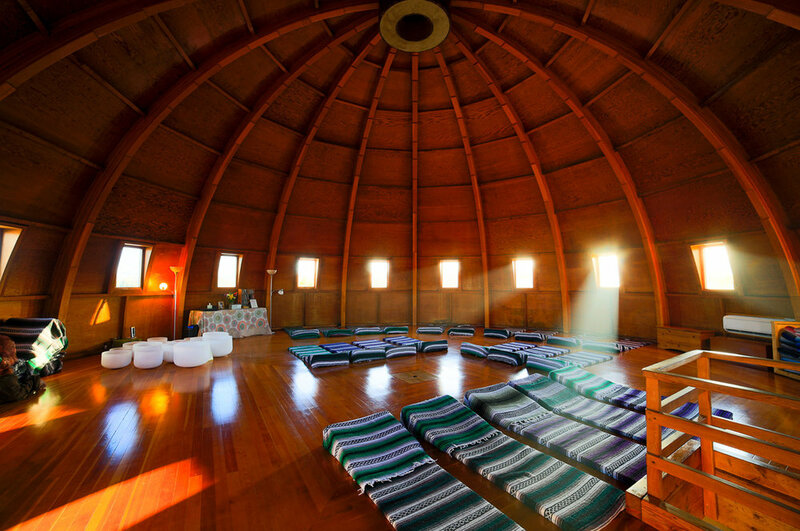 When in Palm Springs you must venture 45-minutes outside of the city to experience a sound bath at Integraton. Equal parts art, science, and magic, Integraton is “A resonant tabernacle and energy machine sited on a powerful geomagnetic vortex in the magical Mojave Desert.” Need I say more? Although most city dwellers visit Palm Springs to relax, unwind, and throw their Fitbits out the window, there is also ample adventuring opportunities if that’s your thing. While you can certainly find some great hikes just 10-minutes from the center of town, Joshua Tree National Park is only a 40-minute drive outside of Palm Springs. If you’re staying for longer than a weekend, I highly recommend making the trek! It’s otherworldly. Another not-to-miss new age spot just outside of PSP, Salvation Mountain (you might recognize it from Instagram) was created by Leonard Knight as a tribute to God to share the message "God Is Love." Go here for color and take lots of pics! Featuring farm to table local ingredients and perfectly strung paintings of Frida Kahlo, La Serena’s Villas restaurant Azucar Palm Springs is a MUST. (In all caps.) The pictures speak for themselves. The decor is phenomenal. And the healthy-ish focus on wellness is the icing on the gluten-free cake. Originally an old-school saloon in Pioneertown, twenty-eighteen Pappy and Harriet’s Pioneertown Palace doubles as a roadhouse restaurant/indie rock music venue. Like any good saloon, P&H’s has a jukebox, pool table, and major dive bar feels. Expect Tex-Mex style BBQ cuisine and live music almost every night. Go for dinner. Famous musicians perform secret shows here when they’re staying in Palm Springs. Home to the world’s greatest bloody mary according to my boyfriend, this award-winning eatery is the ultimate crowd pleaser. With an eclectic menu large enough to rival an actual football field, Lulu’s is a Coachella Valley hotspot. Sit outside for some of the best people watching in Palm Springs. The menu at Reservoir is small compared to Lulu’s, but let’s be real, anything would. Featuring classic southern California cuisine and healthy-ish options like avocado toast, you honestly can’t go wrong here. Located in the Uptown Design District of Palm Springs right next to Arrive, Reservoir offers breakfast, brunch, lunch, and dinner 365 days a year. Have you been to Palm Springs? Are you planning a weekend getaway? Share your PSP hotspots in the comment section below. We write kickass emails. Biweekly-ish to a select group of Alchemy Insiders on stuff you’ll probably want to know about like high vibe nutrition knowledge, how to feel good, and other things that will catapult you into achieving the life of your dreams. Sign up to receive exclusive insights from us, with love.